If there was one thing I can eat for the rest of my life, it would have to be seafood. I grew up living near the coastal area, meaning our daily meals include fish, crabs or shrimp. The water provides and so does my dad, who was a proud fisherman just like his father before him. Other than being awesome, my dad loves to cook. During special occasions, he would cook us his favorite chili shrimp and crabs . He makes it a point to have shrimp or send me some over here since I moved out. My colleagues and I share a passion for food and laughter. So when the Training team decided to hit the nearest seafood place in Alabang, was I giddy with excitement. 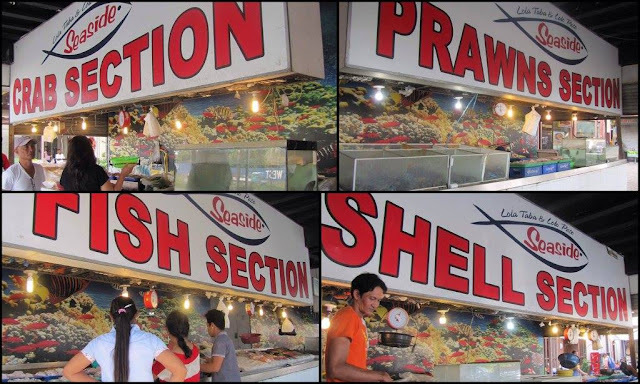 Seafood isn't really common here in Dasmariñas however it does mean that you need to wake up early to get the freshest catch from the market. I could not find a good and reliable seafood restaurant in town as well. Having little to no knowledge about the place, I signed up for the long trip. From Pala-pala - traverse through Daang-Hari by turning right from The District Ayala Mall, Dasmarinas. From Pala-pala - drive through SM Molino by turning right from Central Mall passing parts of Salawag, Salitran and Molino. This was our route, it was heavy traffic. If you have no driving app yet, download Waze and trust it's decisions. It can help you big time. Arriving at around 3PM, we headed straight to the Wet Market. It is divided to different stations: Crab, Shell, Prawn and Fish. You select what you want and how many kilos needed from the stations and the cashier will consolidate all seafood sales for you. Expectation: Seafood prices to be a bit expensive. Tip: Do not get overwhelmed, just eyeball everything and see if what you get is enough for the entire team. It is best to have a designated seafood shopper. Tip: Pay with cash here. If you are using a credit card, a 10% fee is added on top of the seafood sales. After some shopping, we headed to Aling Tonya's Seafood Palutuan. There were several palutuan places nearby, a Korean restaurant and a few more however we decided to dine at Aling Tonya's as it was the most visited spot in the area. The space was wide enough for families and even your barangay with seats extending to the second floor. They pride in being 100% MSG free and cooks à la minute. The place rather unassuming gets filled up fast. You can see folks in groups, pairs, workmates and of course families and friends come and go. We had our food cooked several ways: adobong squid, buttered shrimp, chili crabs, fish, clam chowder and countless rice platters. The meal was worth every penny and worth the wait as well as the long drive over. It was a feast that demanded rice and a few more cans of soda. After all the food, laughter and a doggy bag to go, we were all spent. Filled to the brim with seafood goodness minus the umay factor. Aling Tonya's is a great place to visit when one wants to veer away from the usual fast food flair at the mall. Perfect for groups and even when alone and just needing to satiate that seafood craving. I was not able to take other photos of the spread, my hands were busy peeling shrimp shells. A definite place to visit for any seafood fanatics out there. 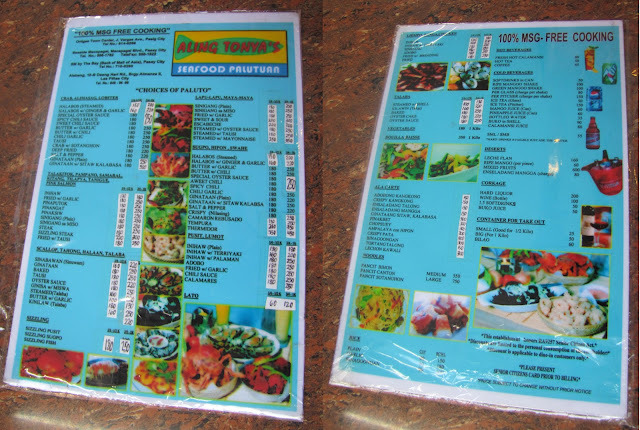 If you are a seafood lover like myself, head out to Aling Tonya's at a nearest branch near you!